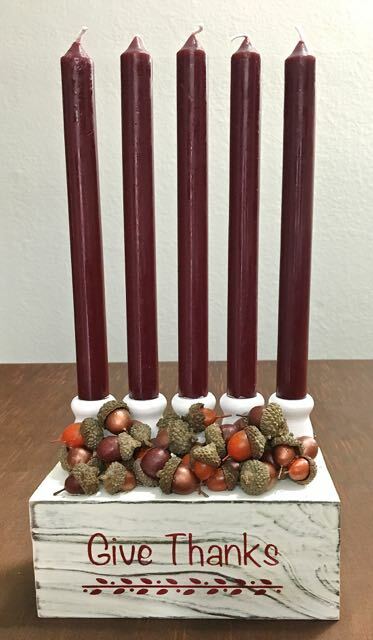 The colors of Autumn combine in this easy to make project adorned with faux acorns painted in wine, copper and orange. Measuring 7" x 5.25" (without candles) this centerpiece makes an impressive display for a table or buffet. Traditional tapered candles (mine are 10") nested in white wooden candle cups are attached to the wooden bin beneath them. 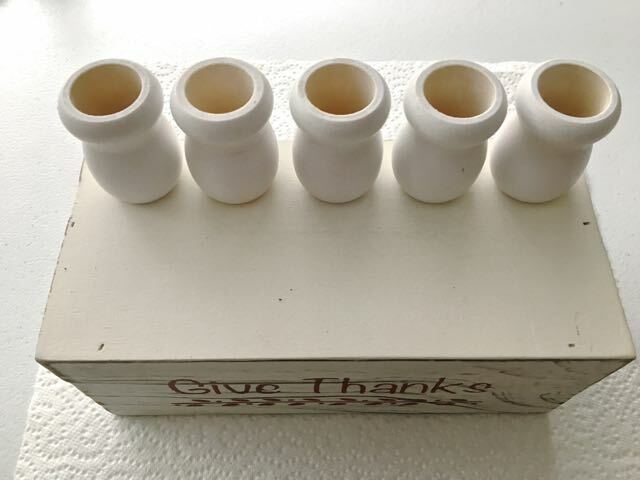 The bin comes with a weathered look giving the centerpiece a unique canvas for your painted "Give Thanks" message. Hot glue anchors the acorns and candle cups to the bin. The tutorial includes the free stencil for the lettered message. Get ready for the holidays and give thanks for simple projects like this! step 1 - Print out the "Give Thanks" message on card stock. With a craft knife or stencil cutting machine, cut out the black areas. Use painters tape to holed the centers of the "a" and "e" in position. Mark the vertical center to help with alignment. step 2 - Turn the stencil over and apply adhesive. Align the center of the card stock with the center of the bin. Press the adhesive side of the stencil to the surface. step 3 - Mix red and a bit of green paint together in a small container to create a wine color. Fill a paint cup and airbrush the stencil. step 4 - Airbrush one third of the acorns with the wine paint. With a gloved hand, protect the acorn caps as you apply the color. Roll the acorn between your fingers to paint all sides. step 5 - Airbrush an equal number of acorns with the copper and the orange paint. step 6 - The wooden candle cups come ready for paint. Airbrush them with white paint. step 7 - Position the five candle cups equal distance from each other toward the back of the bin. Attach them with hot glue. step 8 - Alternating the acorn colors and sizes, hot glue a row onto the bin in front of the candle cups. Continue filling the space then begin stacking and gluing until you've used up all the acorns. Step 9 - Place five tall tapered candles in the cups.